The result confirmed England's total dominance of this year's tournament and on this form it will be hard to see them threatened by anyone other than France in the coming seasons. With a bonus point in every single game this tournament, equally impressive has been the form of the younger players in this squad with Sarah Bern, Hannah Botterman and Jess Breach among the faces set to dominate for years to come, while England's experienced players like Sarah Hunter and Katy Daley-Mclean were also outstanding throughout. The victory over Scotland means that England scored over 50 points in four of their five games, scoring 45 tries over the tournament. It is England's 15th win of the tournament since its inception in 1996, the 14th time they have won the Grand Slam and their 20th Triple Crown. 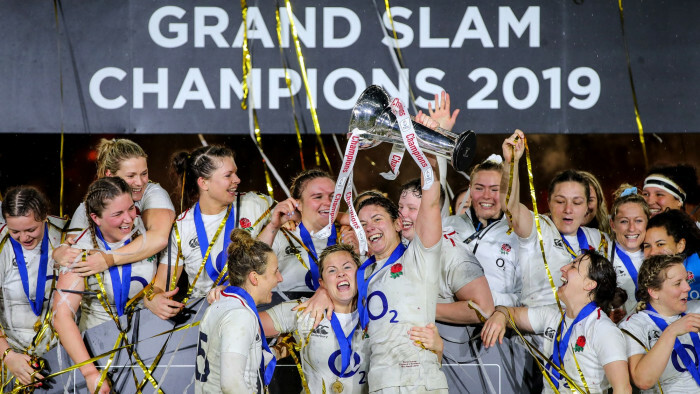 In front of a crowd of 13,278 - a record for an England women's home game outside of a World Cup - England scored 12 tries in all. It took just over two minutes for the rout to start when Poppy Cleall broke the line and fed Sarah Beckett for the flanker to cross under the sticks. A cross field kick from Daley-Mclean was gathered as the ball bounced by wing Breach and then Natasha Hunt darted through from a quick tap penalty before Breach got onto Scarratt's kick forward for her second and England's bonus-point. Sarah Bern's powerful drive off the back of a ruck got England's first try of the second half with captain Sarah Hunter scoring in similar circumstances a few minutes later. And further tries from Scarratt, Cleall and Cath O'Donnell wrapped it up. For Scotland it marked the end of a difficult campaign, and Shade Munro announced afterwards that he would be stepping down as head coach. Head Coach Simon Middleton commented: “I’m absolutely thrilled with the outcome. Our goal was to win the Six Nations and we’ve done that and done it great style. “Our extended aim was to put in an improved performance and grow as a squad both on and off the field and I think that we’ve done that.